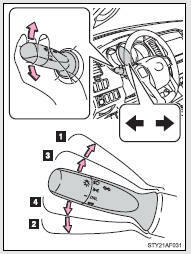 Move and hold the lever partway to signal a lane change. The right hand signal will flash until you release the lever. The left hand signal will flash until you release the lever. The engine switch is in the ON position.